First, some background. Each May the NBA invites around 60 players to the draft combine in order to be poked, prodded, interviewed, and evaluated by NBA teams before the July draft. In the past, the deadline for college players to withdraw from the NBA Draft and maintain eligibility was prior to the combine. Players had to withdraw before being able to meet with dozens of teams at the combine and get a true gauge of where (or whether) they were likely to be drafted. In January, in an ostensibly pro-player shift, the NCAA moved the deadline to withdraw from the draft to 10 days after the combine. The expectation was that a few more players—unsure about whether to go pro or return to college—would put their name in, be invited to the combine, and gain more information in order to make an informed decision about their future. 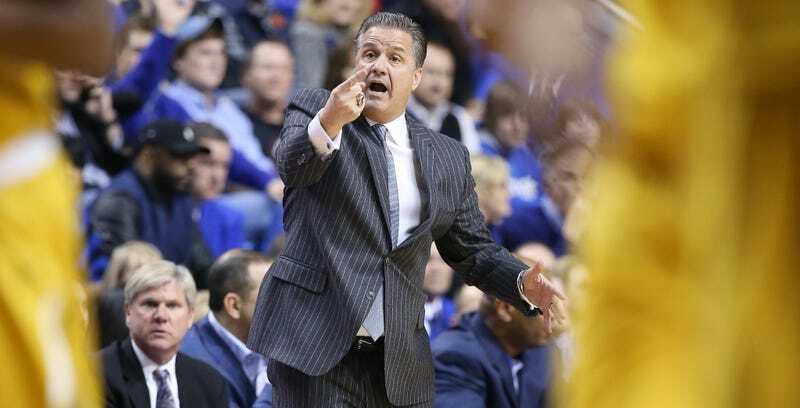 And then, as usual, John Calipari went and screwed everything up. This is what John Calipari does to rules. In some ways he offers the most honest deal in college basketball. Not a good deal, to be clear—it’s still monstrously unfair to college athletes—but one more upfront, at least. Calipari rarely hides behind amateurism or student-athlete rhetoric when talking about the NBA age limit. Rather, he tells talented high schoolers that if they come to Kentucky and help him win an NCAA championship, he will prepare them for the NBA during what is expected to be their lone season in Lexington. While this particular move reeks of publicity—especially announcing it on the eve of the Sweet Sixteen, which Kentucky won’t be participating in because they were knocked out of the tournament—everything Calipari tweeted is true. There is no downside to declaring for the draft. If the NBA doesn’t even invite the player to the combine, they know they aren’t likely to be drafted. And if they are invited—even if they have every intention of returning to school—they can gain a better understanding of the combine process to improve in the future, and get otherwise forbidden access to NBA teams. John Calipari has a well-honed ability to combine the self-serving with speaking a limited form of truth to power, to pair his selfish interests with his players’ (or potential players’). It’s a big part of why he has been a successful basketball coach (and even more successful recruiter). Not every eligible player will suddenly declare for the draft. The vast majority of the 4,500 D1 basketball players have no shot at being drafted, and some who are intent on returning for another year might think the combine is a waste of their time. But for any player who wasn’t already aware of the benefits of declaring, Calipari has made them quite clear. And if any coaches publicly come out against borderline NBA prospects declaring? That’s just another leg up for Coach Cal in the recruiting battle for the next crop of one-and-dones.